'Tim's Vermeer' is screening at Century Regency Cinema, 280 Smith Ranch Road, San Rafael. 415.479.2130. 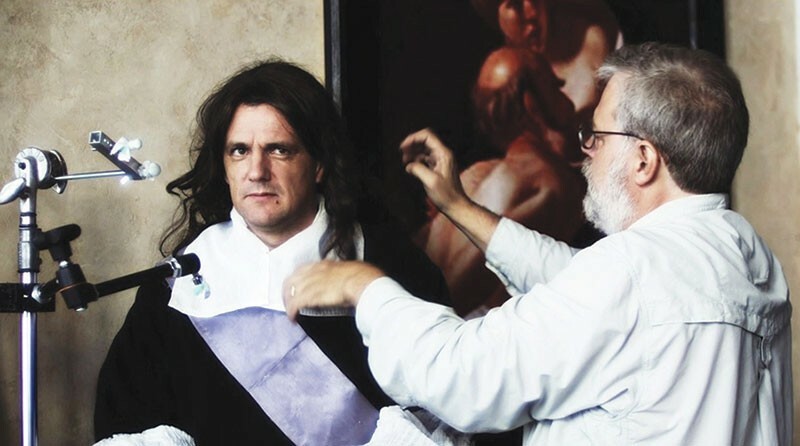 The film features inventor Tim Jenison testing a theory of what made Jan Vermeer (1632–1675), little known in his day, the most rhapsodized-about artist of the golden age of the Dutch Republic. As debunker-magicians, Penn and Teller have offered audiences mystification in the name of demystification, and here, a solution to the mystery of Vermeer—"a fathomless genius, now a fathomable one," says narrator Penn (Teller directs). He's a little wrong, yet the movie is right: it honors an artist's labor and the inspiration that can't be copied. Jenison read David Hockney's Secret Knowledge and Vermeer's Camera by historian Philip Steadman. Those books argue that Vermeer's departure from rival painters may have been due to some optical advantage. Could he have utilized a camera obscura? Jenison took six years to backwards-engineer Vermeer's Music Lesson. His obsession is remarkable—he learns to read Dutch, to grind lenses and to mix Vermeer's famous lapis lazuli pigment. He builds a scrim in the shape of the nearby buildings that would have shadowed Vermeer's north-facing window, and he talks his daughter into donning a head-brace to model for the painting's female figure. Then he set to work. He tested the camera obscura theory, but got better results with lenses, a concave mirror and hand mirror on a stick. Using this equipment, a nonpainter—a dedicated, picky and observant nonpainter, certainly—created an impressive replica. The result is a very moving film, in video diary form, about Jenison's mad, lonely effort—even as Jillette quips that "it's like watching paint dry." It also offers a convincing argument that Vermeer saw better than the unaided eye could have, through, for example, gradations of gray that the optic nerve can't pick up. It's a remarkable achievement. But a close look shows that the perfection of Vermeer's original isn't in Jenison's amazingly hard work. You can tell the difference. The irreproducible element remains, even if you get everything else right.